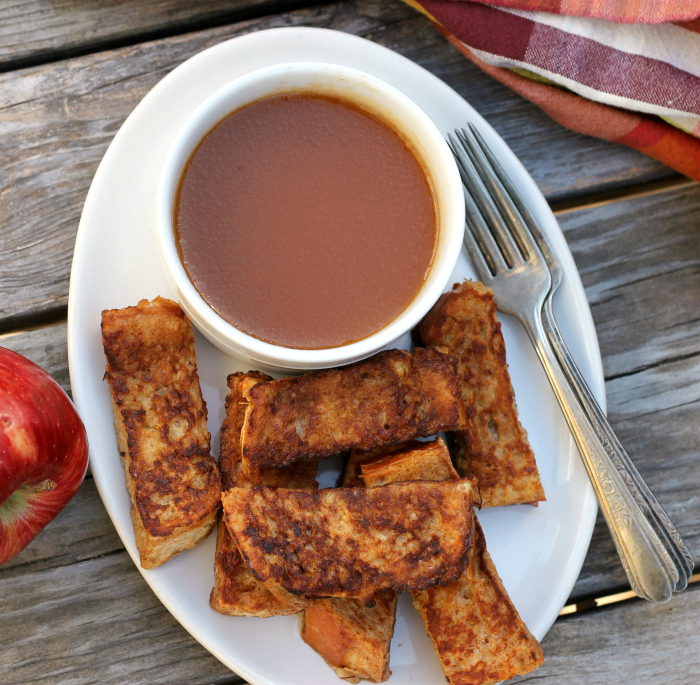 French toast sticks are a fun way to French toast… add in the apple syrup… a perfect weekend breakfast or brunch. I think we finally are done with the celebration for my birthday, oh yeah and Mike’s too. I think I have mentioned this before, but Mike and I have the same birthday. Yeah, it is kind of cool. He was the first person that I met that had a birthday the same as I did. Now there are two more in the family that have their birthdays on our birthday. That is right! I have a great-niece and my nephew’s wife share the same birthday as Mike and I do. Isn’t that wild?!? So, this weekend most of our kids were at our house to celebrate our birthday. We even had a delicious meal made in honor of our birthday. And just a lot of fun, laughter, and love. Mike and I have been so blessed with a wonderful and loving family. Since I had family around I thought I would do a fun thing for Sunday breakfast… I guess I was a little late with that, let’s just say it was more of a brunch. I have wanted to make apple syrup of late, since it is fall and apple season. The first time I made the syrup, it did not turn out at all, so it was back to the old drawing board. After changing a few things around the apple syrup was quite yummy. It went very nicely with the French toast that had a hint of cinnamon to it. Want a change of pace? 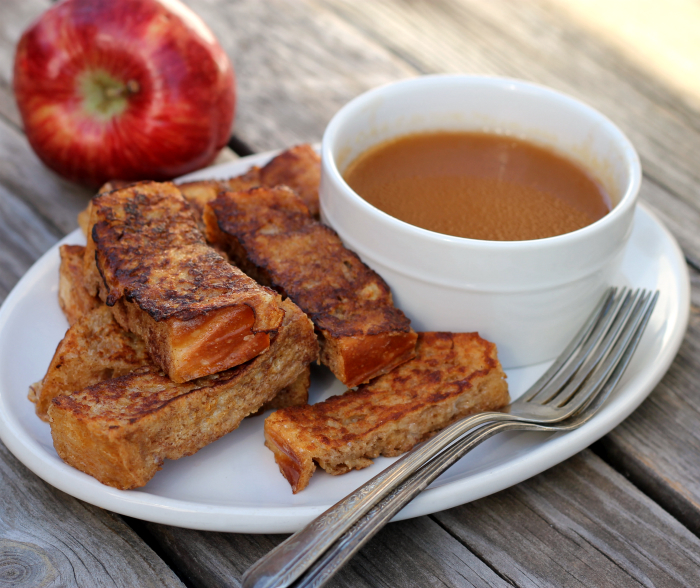 Try this apple syrup on your next French toast or pancakes. Start off with making the apple syrup. In a medium sauce pan add the apple juice. Sift together the dry ingredients, slowly pour the dry ingredients into the apple juice, as you pour in the dry ingredients whisk so that you don't get any lumps. Heat over medium heat, bring to a boil and let boil for a minute or two. Reduce heat and cook until the syrup is slightly thickened. As the syrup is cooking prepare the French toast. In a flat bottom bowl whisk together the eggs, milk, sugar, cinnamon,pinch of salt, and vanilla. 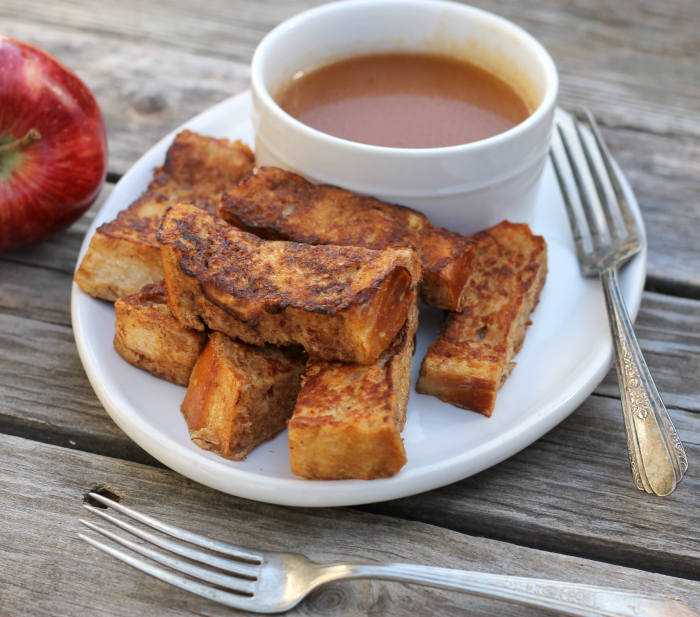 Take the French toast sticks and place in the egg mixture, coating each side. Heat skillet over medium heat add enough butter to coat the bottom of the pan. Place a few sticks of French toast in the pan, do not over crowd (the French toast will not fry properly). Remove from pan when all of the sides are nicely browned. 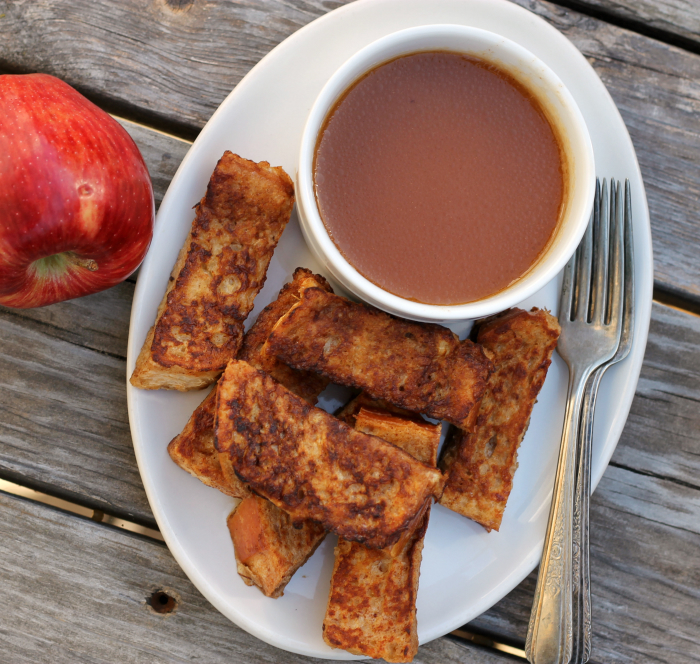 Serve with the apple syrup. Nothing like good breakfast food, any time of day. Love it. They look fantastic! I would love some for my breakfast too. Hi Dawn, I bet the apple syrup was amazing with French toast. That’s wild that you and your husband have the same birthday, Happy birthday to both of you! Birthday celebrations at your house must be amazing! 😉 And what’s amazing are these little French toast strips. Love the idea! And apple syrup? New to me — sounds wonderful. Gotta try it! Thanks so much. This looks like a wonderful brunch, Dawn! I really look forward to trying the apple syrup – I love making homemade syrups! Apple syrup sounds wonderful! What a treat. I love how it is so “fall”! This looks divine! Pinned for later!